Think back to your time as a trainee. Do you remember an interaction with a consultant in which you learned something, felt your opinion was heard, were empowered to collaborate with the consulting team and knew you were pro­viding outstanding care? We suspect a number of examples come to mind, regardless of the amount of time that has passed. Such events are memorable because the consult interaction is a powerful experience with far-reaching positive impact. Learning that occurs during consultation is inherently problem centered and experience based, and fills an immediately applicable need for the learner, thereby encompassing key adult learning principles that make learning effective. The consult interaction is also an efficient teaching interaction, which is particularly important in an era of work-hour limitations and increased patient turnover, which have decreased the time available for learning. 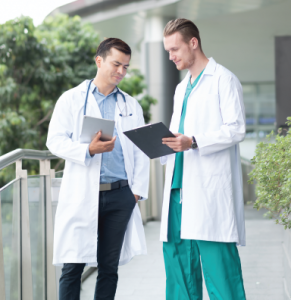 The elusive “teachable moment” is set up by the consult question, and because both the requesting physician and the consultant have seen the patient, teaching and learning can occur effectively without the need for lengthy presentations. The consultant may benefit from the interaction by empowering the requesting physician to be an active collaborator in the patient’s care and enabling them to work up and treat similar problems in the future. Despite the potential positive impact of consultation, effective consult interactions face considerable barriers in both the outpatient and inpatient settings.1 In the outpatient setting, the asynchronous nature of consultation and challenges inherent in direct communication between outpatient providers constitute key barriers. In­patient consultation ameliorates these barriers because consultants and teams requesting consultation work in physical proximity.